QNAP has introduced a new fanless NAS aimed primarily at home users. The HS-453DX Silent NAS can house two hard drives and it is powered by a quad-core Gemini Lake SoC. Featuring both 10 GbE connectivity as well as an HDMI 2.0 port, the box can be used to store data or to serve as an ultimate media player with massive storage capabilities. The QNAP HS-453DX Silent NAS is based on Intel's Celeron J4105 (4C/4T, 1.5 – 2.5 GHz, 4 MB, UHD Graphics 600) SoC paired with dual-channel 4 or 8 GB DDR4 memory. 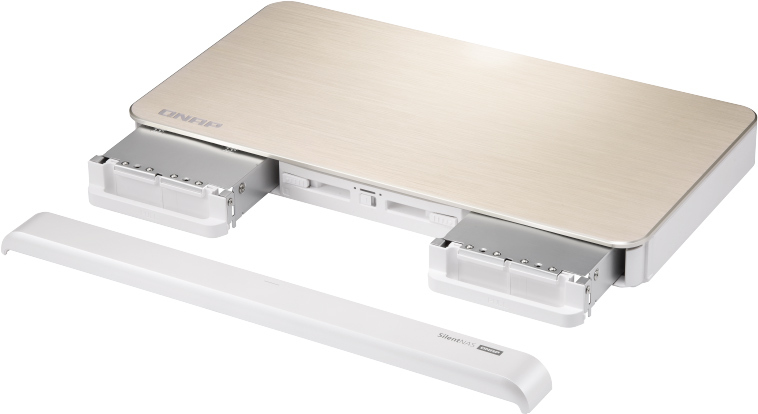 The device can accommodate two 3.5-inch hard drives and two M.2 SATA SSDs for caching. The NAS fully supports the latest HDDs, so it can work with two Seagate’s 14TB IronWolf drives, allowing it to hit 28 TB of storage space in total. Courtesy to Gemini Lake media decoding/encoding engine, the NAS supports direct 4Kp60 playback over HDMI 2.0 and transcoding videos for other devices (Apple TV, Amazon Fire TV, Google Chromecast, DLNA devices, etc.). To ensure that the NAS could be used as a media player, it is compatible with QNAP’s RM-IR004 remote control. As for connectivity, the HS-453DX has a 10GBASE-T five-speed port supporting 10G, 5G, 2.5G, 1G, and 100M speeds. Other ports include an additional GbE, another HDMI 1.4 output, one USB 3.0 Type-C port, two USB 2.0 and two USB 3.0 Type-A connectors, as well as three 3.5-mm audio jacks. When it comes to performance, SSD caching enables the QNAP HS-453DX Silent NAS to offer up to 677 MB/s read/write speeds when SSDs operate in RAID mode. To ensure that solid-state drives have a long lifespan, QNAP’s software allows to manually set software-defined SSD RAID over-provisioning. Speaking of software, it is necessary to note that QNAP’s new NAS uses QTS operating system and therefore supports all the applications developed for this software platform. QNAP’s HS-453DX Silent NAS is now available to the company’s partners, so expect it in retail in the coming weeks and months depending on the region. Other I/O LEDs, speaker, etc. Dimensions Height 42.8 mm | 1.68"
Width 404 mm | 15.9"
Depth 220 mm | 8.66"
Oh, and one feature that would make me happy: UHS-II SD-card reader that automatically copies content from the card into configurable folder on NAS. I've had the outgoing model HS-251+ for about 2 years and what I see here is going to be more of the same mediocre unsatisfactory experience. The point of this SilentNAS multimedia player product, at least for me, was to have a very quiet NAS in the living room storing multimedia files that could also be used as a multimedia player connected directly to the TV and sound system with no additional equipment needed, and with an attractive design. Well, once you use the recommended NAS drives (I went for WD Reds because spinning at 5900rpm they were supposed to be a little quieter) it kind of defeats the purpose because it is not silent anymore, quite a lot of vibration even when hardly accessing the disks, and lots of noise when they were accesed, just like a regular NAS, minus the fans. Very annoying in the quiet part of movies or music, and even more so if you are just trying to read in silence. SSD are of course the way, but the price per GB makes it stupidly expensive if you need a reasonable amount of storage, and then with only two drive slots you are not going to go very far, even with cost being no object. So silent, yes, but not really in the real world. Then there is the player part of the product and this can only be described as unusable. There was, guess still is, a Linux virtualised layer on top of QTS, that could host apps capable of HDMI output, such as Kodi and others. Kodi was officially pulled out at one point with no real explanation, and even when available was slow and buggy compared. The other apps were crap. The remote was poor. Funny that in the marketing literature for the current product, the player part of this system is not really covered at all, there is the mention of HDMI outputs and that’s basically it. A lot of people are going to be as disappointed as I am when the find out how it works in practice. So, it doesn’t really work silently and is a very poor multimedia player. So, what’s the point? The only thing going for it, is that designwise it is ok for a living room, but that´s nowhere near enough. "my recommendation for my use case, is to just use a traditional NAS housed outside the room and proper multimedia players"